Here is an intrusting little knife that came to me to have the tip repaired had a little chip at the tip. 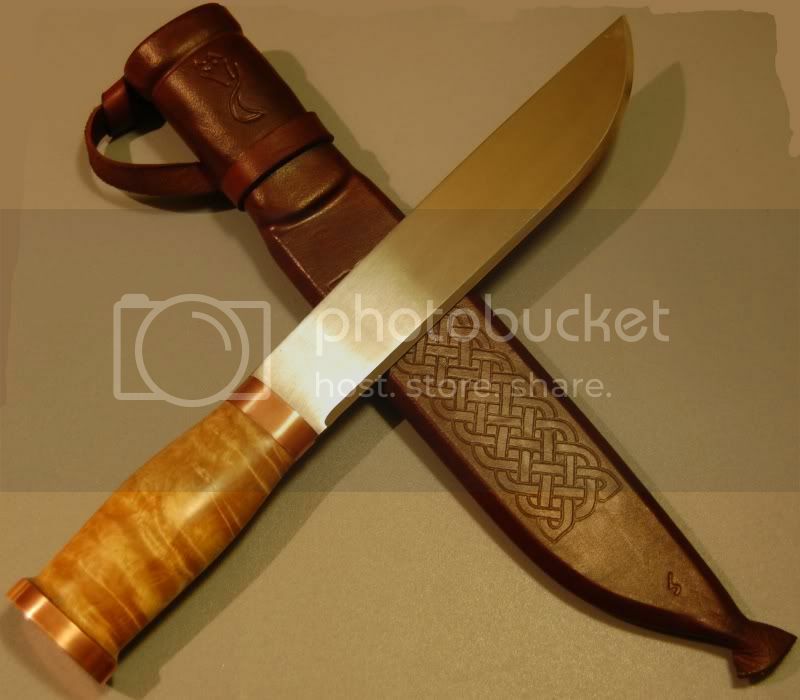 It belongs to a friend of mine, it was made by his grandfather who was a norwegian knife maker, his name is Geilo Brusletto. Think the knife is 60+ years old, is 8" overall , think it is a laminated blade, it is in excellent condition for it's age has had great care. His G-Daddy is a Brusletto knife maker and of the famous family? multiple blades would interest them, but the Rambo knife was all he would look at! supe nice guy. Wow on both of those. No problem Deane, it was nice to be able to think that due to that knife, I can recall some memories! And from the looks of it, with him coming to thw US, via New York and walking all the way to South Dakota! He sounds like an awesome guy! Glad you enjoyed my story of being in Norway, while in the Marines! Not the most intelligent thing to take an 18 year old boy straight out of Alabama, then put him in a "Cold Weather Unit"! Not too smart, but I survived the best I could, being so far out of my element. It was more my likeing in the jungles of Okinawa, Japan! That I liked a lot better!